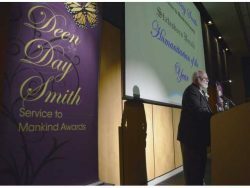 The 2017 Statesboro Herald Humanitarian of the Year “moved our community to new heights of caring,” said Billy Hickman on Tuesday night during the 29th annual Deen Day Smith Service to Mankind Awards gala held at Georgia Southern University’s Nessmith-Lane Continuing Education building. Peace spoke briefly as he accepted the award. Peace “has given over $8 million to Georgia Southern in various ways, helped develop numerous medications that have likely saved countless lives, and inspired and enabled hundreds to obtain degrees in various medicine-related fields,” Hickman said. “He began college at Georgia Southern in 1959 with a loan of $532 that paid for two quarters of tuition. For his third quarter, he secured a Georgia State Teacher’s scholarship, and throughout the rest of his college career at Georgia Southern, he achieved a Bachelor of Science in chemistry while he worked seven part-time jobs to pay for his schooling. This was also how he contributed to the support of his siblings and mother, who suffered from cancer,” he said. Peace “obtained a master’s degree in mathematics at Clemson University, has taught at several colleges and later obtained a PhD in biostatistics from the Medical College of Virginia,” he said. In 1989 he started his own business — Biopharmaceutical Research Consultants — where he played a key role in development and approval of several medications that treat diseases and conditions including Alzheimer’s disease, hypertension, arthritis, anxiety, depression and gastric ulcers. “He is still an adjunct faculty member at several major universities and is active in public health education endeavors at Georgia Southern,” he said. 1998, Peace approached Georgia Southern with the idea of a biostatistics center, a graduate level study program in biostatistics, and development of a school of public health. “He gave up a $1.5 million annual salary with his own company to return to his alma mater in 2000 when GS offered a Master’s degree in biostatistics, which he helped develop,” he said. “He endowed the Jiann-Ping Hu College of Public Health at Georgia Southern, named for his late wife.” Peace has since then continuously recruited, promoted and helped establish the College with his endowment. It was the first College of Public Health in the University System of Georgia. The Board of Regents named the university’s biostatistics center after him – the Karl E Peace Center for Biostatistics, “honoring him for his endless contributions of time, finances and support,” Hickman said. 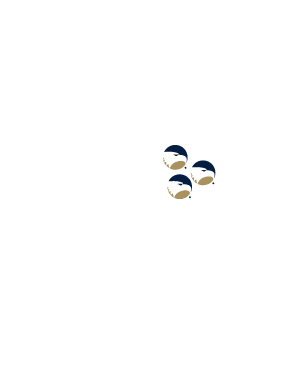 “He has established 21 endowments at five different institutions – 14 of those at Georgia Southern. Peace also supports the Boys and Girls Club of Bulloch County where he volunteers, tutors, mentors and supports financially. He helped raise a total of $265,000 after the club lost a critical grant, matching at least $90,000 in donations personally. He helps members with math, and has funded six grad assistants to help fund data collection and management of statistical analysis, thus helping in their grant writing applications. He chaired the club’s capital campaign in 2009 and in 2011, the Boys and Girls Club of Bulloch County named its academic achievement center for him Hickman said. “Dr. Karl Peace has donated to, supported and volunteered for several entities including Goodwill Industries, the Salvation Army, American Cancer Society, Memorial Health University Medical, Mayo Clinic, the Alzheimer’s Association, United Way, Disabled Veterans, American Red Cross and Easter Seals. “He gave a donation to the local Hearts and Hands Clinic for $5,000 and has donated millions to education and health related activities, enabling hundreds to obtain degrees. He also supports Komen for the Cure, the Georgia Cancer Coalition and the Southwest Georgia Cancer Coalition,” he said. Peace has published 12 books and more than 150 articles on biostatistics and other medical issues. His accolades include being named the 1998 Distinguished Alumni of the Year at Georgia Southern; the 2003 Alumni of the Year; received the first ever Georgia Southern President’s Medal in 2005; and in 2009 won the Georgia Southern Annual Award for Excellence in Research and Scholarly Activity. He was named the Georgia Cancer Coalition’s Cancer Scholar at Georgia Southern from 2002 to 2007. He was the first Georgia Southern grant recipient from the Georgia Research Alliance. Peace endowed the first Eminent Scholar Chair at Georgia Southern and endowed the Karl E. Peace/ JP Hsu Eminent Scholar Chair in Public Health at the university. He has established 14 scholarship endowments at Georgia Southern. Peace is a benefactor of the Georgia Southern Library, the Center for Disabled Students, as well as the music and art departments. “The 2008 recipient of the Deen Day Smith Service to Mankind Awards received a standing ovation from the Georgia House of Representatives in 2009 for his biostatistics and public health contributions, passing a resolution in his honor. In 2009, the US House of representatives cited him for his contributions to drug research,” Hickman said. Peace has received numerous honors and recognition for his work, his dedication and generosity, including the 2008 Tito Mijaries Lifetime Achievement Award from the Philippine Statistics Association. “Dr. Karl Peace’s humanitarian efforts are endless and priceless not only to our community, but to the world,” he said.